Sometimes the most surprising detail in a microscale LEGO model can be the simplest one. 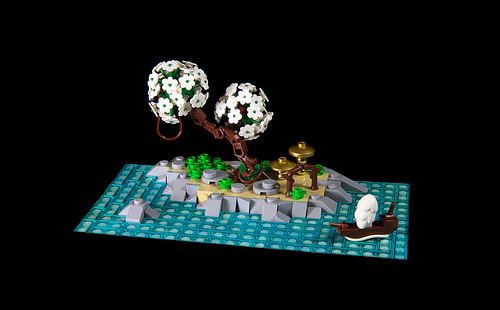 Sad Brick demonstrates this in a simple island scene showing a cherry tree as the centerpiece. I enjoy the use of flower elements still attached to each other to sculpt very spherical foliage. Small gold hut-like dwellings help sell the scale of the massive tree. Approaching the island is a ship with a few more great part usages, like the wing from the chicken suit wearing collectible mini-fig, and a twisted white rubber band for the ship’s wake.